If you have already sold a few products on Etsy marketplace, you can analyse how to create a lucrative listing to attract more customers. So, let’s put your memory through a thought progression, shall we? What are the required product information for jewellery listing on Etsy? Let’s start with the basic steps to lst bulk product on Etsy. Image: If you start listing products manually, you have the option to add 9 product images, so you can add links to 9 image urls on your Etsy product feed for bulk upload as well. Title: Your next step for manual listing would be to add a title for your product. By default, ExportFeed app will grab the product title as on your eCommerce site’s listing. You can customize them to suit your needs with the help of our support team. You can the answer for these questions in the ExportFeed apps and plugins. Category: This is the best-fit product category on Etsy for your products If you look into the homepage of Etsy, you’ll get the idea of the Etsy categories on which your product falls. While listing bulk products of your WooCommerce, BigCommerce or Shopify store, you may need to map products of your store to multiple Etsy categories also. Type: By type of product, Etsy wants to clarify whether the product that you are selling is a physical product or a digital product like designs. This will have an impact on your shipping settings. Description: This information will be displayed to the visitors of Etsy. Here, it is recommended that you provide a product introduction, details of the product like dimensions and such and the story behind the product. It could be your manufacturing process or who would the product suit most and such information. Price: Provide a selling price for your products. While listing bulk products on Etsy using ExportFeed, your Regular price listed for product will be used. If you have provided a value for discounted price then the discounted price is automatically used for the Price attribute.You can make modification to the price values by adding or reducing some amount or adding a discount % for your products. Quantity: Number of products that you are ready to supply or can supply to your buyers – set that number as the quantity of the product available. Some sellers create urgency by setting a lower number as the product quantity available. However, the upper limit is 999. Shipping Origin: Where are you shipping the product from. Processing time: How long will the it take for product to reach buyer? Fixed shipping cost: The cost incurred for shipping the product. While using ExportFeed plugin, you get to set your shipping profile through the plugin or ExportFeed plugin and app will also fetch your default shipping profiles from Etsy. Etsy also allows you to add a custom subcategory for Jewelleries if you don’t find them while listing manually, but it is easier that you list in an available category. We suggest this due to the fact that your potential customers are already accustomed to searching for products in an already available sub-category rather than searching for some new one. 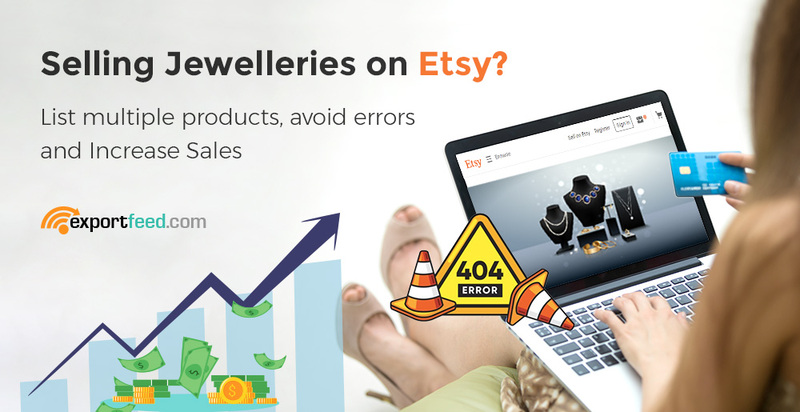 If you ever tried listing bulk jewelleries on Etsy under any of the default sub-categories, it is possible that you get some error like Missing required attribute or similar. You can add those categories by using ExportFeed product customization features. To find out how to easy it is to start selling your jewellery products on Etsy using ExportFeed, feed free to start with our free trial.